Sound is fundamental to spiritual experience. From the mantra of yogic traditions to the Christian belief that “In the beginning was the Word”, sound plays an important part. 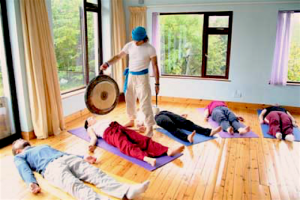 In Kundalini Yoga, the sound of the gong is widely used as part of this experience. According to Mehtab Benton, the gong creates “an extended state of spontaneous meditation and therapeutic relaxation”. Those of us who have enjoyed a gong bath, or the sound of a gong during the relaxation stage of a Kundalini Yoga class know what he means. It is the interaction of the unusual and complex sound qualities of the gong with our sensory systems that causes the meditative effects. Each of our physiologies responds to the sounds in a unique manner; thus, we can be affected differently, even though we are hearing and feeling identical sounds. Gongs of various kinds are believed to have been in existence since the bronze age (circa 3500-2500 BC), with evidence of their use in Mesopotamia. Since then, they have spread around the world. Myth has it that early sacred gongs included meteorite pieces in their construction. The sacred has long been associated with gongs. In some cultures, they were used for healing, banishing evil spirits, controlling the elements and to call on the gods. Over the years, gongs have been used for rituals such as birth, death and marriage, and were often used to demonstrate the wealth of their owners. They were also used to intimidate enemies and, in more peaceful times, for celebrations, festivals and dancing. While they have retained their sacred purposes, gongs are now familiar as musical instruments. In the west, they have had a wide range of exposure, from use by symphony orchestras and rock bands to other forms of entertainment and practical use. For their use in Kundalini Yoga, Yogi Bhajan taught a particular style of playing, which has been continued by practitioners around the world. Traditional gong makers, from China, Burma, Annam and Java, used a process of heating, pouring into moulds, hammering, smoothing, tuning and polishing. For larger gongs, the heating and hammering process might be repeated over 100 times. The modern gongs typically used in Kundalini Yoga, such as those manufactured by the European firm, Paiste, are made from an alloy of brass, nickel and silver. The manufacturing process involves heating and rolling the alloy under pressure to minimise the possibility of cracks or fissures. The gongs are cut from the tempered sheet rather than made from moulds in the traditional manner. The cut discs are heated and then shaped by hammering. After resting for three to four months the gongs are then tuned. To do this, the gong smith hammers the instrument both on the inside and out, tests the sound, and re-hammers until satisfied that the gong is tuned correctly. The gong is then polished and ornamented. As a result of this highly-manual process, each finished gong is highly distinctive with regard to both look and sound. The distinctive sound of the gong is due in part to it being part of a family of instruments called idiophones or ‘self-sounders’. Unlike most instruments, idiophones don’t require a sound box or other device (such as the bell on a horn, or the body of a guitar or piano) to allow the vibrations to produce the sound from a reed, strings or a column of air. Idiophones produce the sound directly. Other examples of idiophones include temple blocks, bells, cymbals and castanets. In common with large church bells, the gong has another characteristic that defines its sound quality. This relates to the way the ‘sound envelope’ dies away (decays) after the gong is struck (the attack). After the attack, the sound of most instruments decays in a predictable, linear manner. However, the gong’s sound envelope is quite different. After the initial attack, the sound peaks and begins to decay smoothly but, after the first decay, the sound builds again with no additional attack. High-quality gongs will produce twelve or more distinctive sound waves when struck. This is the unusual sound that we hear and feel when the gong is used in Kundalini Yoga. Yogi Bhajan used the word “resound” to describe this effect. With each resound and resulting mix of harmonics (identical notes in higher octaves), the sound of the gong becomes more complex and unpredictable. As a result, our minds are unable to categorise the sound. 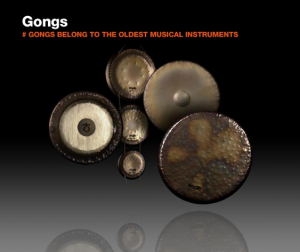 It is difficult to capture this effect electronically – particularly with the digital technology of CDs and MP3 players – and many people find recordings of gong playing less than satisfying once they’ve experienced ‘the real thing’. The individual anatomy of our ears also affects the way we hear the complex sounds of the gong; each person’s brain receives the sound in a unique manner. When we hear lower-pitched undertones in the sound envelope, the combination of sounds is synthesised by the cochlea, the fine hairs in our inner ear, rather than being directly heard in the conventional way. The gong thus produces an inner sound and an outer sound with our brains responding to both. There is a wide range of gongs to choose from. While the modern symphonic gong has an attractive sound, there are many gongs from the solar-system and sound-creation gong families that are designed specifically for yoga and meditation. Solar-system gongs have been tuned to specific frequencies that relate mathematically to the orbits and periodicity of the planets and the moon. Each of these gongs is said to have particular properties associated with the object it is named after. For example, the Saturn gong is designed to enhance concentration, focus and the process of becoming aware of consciousness. It is said to help us be more structured and organised, and better able to take responsibility and complete tasks. The wisdom gained from experience. Sound-creation gongs look quite different and relate to particular elements such as earth, fire and water and also the sun and the moon. They are said to enhance our awareness of basic elemental and emotional polarities and can be used to create balance in a reflective or additive manner. 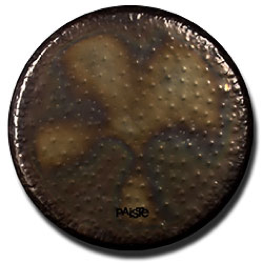 The Paiste earth gong, for example, is described as “alive and multi-layered, peaceful and wide with coarsely structured lows, swelling highs and a dissolving fade” with a sound character that is “mysterious, knowing, remembering, strengthening, unfathomable and deep”. Whether these differences can be detected by an untrained ear is not clear; perhaps the best advice for aspiring gong yogis is to choose a gong that meets your requirements ‘on paper’ and above all, sounds and feels right. In Kundalini Yoga, the gong is generally used during the long relaxation session, or for a gong bath, which is a form of guided meditation. In some instances, the gong can also be used within the Kriya, although this takes special planning and skill. In this case, it is generally advisable to have one teacher instructing the class and a second teacher playing the gong. The gong is not used as background music. It has a specific purpose within the Kriya and must be used carefully, due to its powerful effects. In all of these cases, the gong is played when the listeners are relaxed and receptive. In this environment, the gong induces a more meditative state. Employing a ‘build and release’ cycle, the gong player uses the instrument to release tension in the listeners. To deepen the relaxation, the gong is then played softly until the session ends with a fading sound. Some gong masters use the gong to work with individuals in the class. In the photograph below, Sotantar is guiding the energies into various parts of the person and moving the gong over and back across the person and their energy field. The sound of the gong is often felt through the skin as well as heard. Nerve endings in the skin (dermatomes) sense the sound as vibrations and carry it to the spinal column where the sensation is transmitted to the brain. 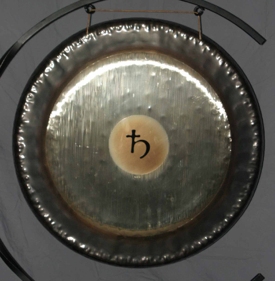 As the gong is played, it stimulates the parasympathetic system, which becomes dominant during a deeply relaxed state, particularly when the eyes are closed. At the end of the session, it is important to bring the listener out of this deep state slowly and gently. As teachers, we are trained to be aware that use of the gong may produce an array of reactions amongst students. Because the gong is so powerful, emotions can range from joy and bliss to tears and sadness. Typically, though, it’s the joy that predominates. Hence the quotes from people who have enjoyed a gong session in our Kundalini Yoga classes at Seaford, Frankston, Mt Eliza and elsewhere: “Blissful”, “Amazing experience”.